It's only a few more weeks until March 4th and my favorite recurring RTE ("Ride to Eat") event: the "First Sunday" Breakfast Ride-In in Ephrata, PA. The "First Sunday" event is held rain or shine on the (duh) first Sunday of the month, March through November, hosted by Ephrata's American Legion post. The Legion hall's parking lot is huge, and there is also a lot of parking available at the adjacent park, so one is never more than about 100 yards away from the hall, where a breakfast buffet runs 9:00 a.m. to noon. Bikes begin arriving as early as 0800 (that's 8:00 a.m. for you civilians), and coffee is served in the parking lot if one wants to get a jolt (or warm-up more likely in March) without paying or waiting for the buffet. If you go, bring a camera! Nice weather brings out 500+ bikes of all sorts, from scooters to sport-tourers to choppers to vintage machinery, and even iffy weather will see a couple of hundred. Bimotas, WWII sidehacks with machine guns, mirror-festooned Vespas -- everything makes an appearance. I once saw a full-on, no-way street legal roadracer with slicks, leaning up against a wall (no kickstand). 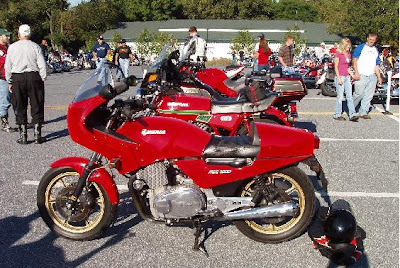 I snapped the picture above last year -- that's a Laverda RGS 1000 in front and a Ducati 860 behind; examples of the type of rare motorcycles often seen at Ephrata. A handful of vendors and dealers will have tents there as well, including my favorite Arai helmet specialists, The Service Pavilion. From east or west, take your favorite route to US 322 to Ephrata (US 322 is Main Street in Ephrata) to Cocalico Street (there will usually be someone directing traffic), and follow the road to the American Legion Post. No website for this event, but for addtional info call 717-733-2576. My Ride Calendar also has details and directions. Gimme a shout if you ever go -- I'll be the only there one on a yellow ZR-7S with Delaware tags! Depending on my schedule I wouldn't mind riding to eat in Ephrata. It's only about 130 miles from here. It would be a nice adventure! Hi Steve; I've read you blog a few times...discovered it on the Aerostich site. 130 early morning backroad miles outta work up an appetite eh?